November 2, 2017 (Hartford, Conn): Today PBS, America’s largest public media enterprise, and Eater, the leading food and dining brand from Vox Media, announced the launch of a new original television series, No Passport Required (working title), hosted by internationally renowned chef Marcus Samuelsson. No Passport Required will celebrate America’s diverse cultural mosaic as Samuelsson travels to under-explored parts of American cities to showcase the people, places, and culinary flavors of immigrant communities. The series begins production this year and marks Eater’s first expansion into network television programming. No Passport Required will premiere in 2018 on PBS. 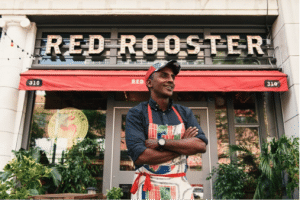 Chef Samuelsson — co-owner of New York’s critically acclaimed Red Rooster Harlem — embodies America’s extraordinarily rich cultural diversity. Born in Ethiopia, raised in Sweden, and a proud resident of Harlem, he’s inspired by this global background to infuse his culinary experiences with diverse elements of music, history, culture, and the arts. Today, he is a celebrated award-winning chef, restaurateur, author, philanthropist, and food activist. Samuelsson’s accolades include earning five James Beard Awards, being named the youngest chef ever to receive a three-star review from The New York Times, and having the honor of cooking for the Obama administration’s first state dinner. He is an ambassador for UNICEF, co-founder of the Harlem EatUp! Festival, and the co-chair of the board of Careers through Culinary Arts Program (C-CAP). No Passport Required will be produced by Vox Entertainment, Vox Media’s Los Angeles-based development, production, and distribution division. The show is slated for six 60-minute episodes that follow Samuelsson as he explores communities that reveal the best global cuisine hidden in America’s backyards — from the flavorful fare of Washington, D.C.’s Little Ethiopia to Fremont, California’s Little Kabul with its large Afghan population, to the thriving Vietnamese shrimpers on the bayous of Louisiana. The story will continue through a nationwide series of events that bring the featured cuisines to audiences in each city, through exclusive behind-the-scenes digital content on Eater and PBS.org, and through local outreach by PBS member stations and Eater’s local city platforms. Vox Entertainment is Vox Media’s Los Angeles-based development, production, and distribution division. In the fall of 2017, the group also announced two new original video series: Divided States of Women, a franchise launched in partnership with Comcast and hosted by award-winning reporter Liz Plank, which premiered this fall on a new digital platform and across Watchable’s online platforms, and Foul Play, a true-crime sports documentary series produced with Vox Media’s SB Nation in partnership with Verizon’s go90 that will debut later this year. PREFAB NATION a series from Vox Media’s Curbed produced in partnership with A&E’s FYI Channel, focuses on the real estate trend of prefabricated homes, and is currently in production. Eater is the most trusted voice in the food and dining world. With the only team of dedicated journalists in 24 markets across North America and the UK, Eater goes deeper into the cities, restaurants, bars, chefs, ingredients, experiences, and stories that are defining culture today. Eater boasts a robust calendar of video programming and has garnered more than a million video views on YouTube for original series such as Dining on a Dime, Cult Following, and The Meat Show. The Connecticut Public Broadcasting Network (CPBN) is home to CPTV, WNPR, and the Learning Lab. CPTV is a locally and nationally recognized producer and presenter of quality public television programming, including original documentaries, public affairs, and educational programming. WNPR is an affiliate of National Public Radio, Public Radio International, and American Public Media. The Learning Lab serves high school seniors through a partnership with Hartford Public Schools and the Journalism and Media Academy Magnet School. It is also home to the Institute for Advanced Media, a program that provides the men and women of our armed forces and adult learners an opportunity to learn skills necessary for the 21st century digital media workplace. For more information, visit cpbn.org.